We have developed a targeted metabolomics screen which consists of using two isotopically labeled glucose compounds to conduct a dual oral glucose tolerance test in rats. This dual isotopic oral glucose tolerance test (DIS-OGTT) can be used to select drug candidates that have “on”- target or have “off”-target effects on oral glucose absorption, hepatic glucose production or glucose disposal. The DIS-OGTT assay utilized intravenously administered [6-13C1-6, 6’-2H2]-glucose and orally administered [U-13C6] glucose to monitor glucose homeostasis. In the experiment, a constant intravenous dose of [6-13C1-6, 6’-2H2] glucose was converted in vivo to a series of [M+1] glucose isotopomers and unlabeled [M] glucose via gluconeogenesis while the orally administered [U-13C6] glucose was converted to a series of [M+3] and [M+2] glucose isotopomers via gluconeogenesis. The detection platform of the assay was based on a negative mode electrospray ionization liquid chromatography tandem mass spectrometry method where the deprotonated glucose anion and its various isotopomers were quantitated in rat plasma using multiple reaction monitoring techniques. The in vivo rat DIS-OGTT assay was a sensitive method for understanding drug candidates underlying postprandial effects on glucose absorption, hepatic glucose production, and insulin controlled glucose disposal. Since glucose derivatization was not required for this assay, a higher sample throughput DIS-OGTT was achieved. Keywords: Glucose homeostasis, Liquid chromatography tandem mass spectrometry, Oral glucose tolerance test, [6-13C1-6, 6’- 2H2] glucose, [U-13C6] glucose, Drug screening, In vivo rat. Keywords:Glucose homeostasis, Liquid chromatography tandem mass spectrometry, Oral glucose tolerance test, [6-13C1-6, 6’- 2H2] glucose, [U-13C6] glucose, Drug screening, In vivo rat. Abstract:We have developed a targeted metabolomics screen which consists of using two isotopically labeled glucose compounds to conduct a dual oral glucose tolerance test in rats. This dual isotopic oral glucose tolerance test (DIS-OGTT) can be used to select drug candidates that have “on”- target or have “off”-target effects on oral glucose absorption, hepatic glucose production or glucose disposal. The DIS-OGTT assay utilized intravenously administered [6-13C1-6, 6’-2H2]-glucose and orally administered [U-13C6] glucose to monitor glucose homeostasis. 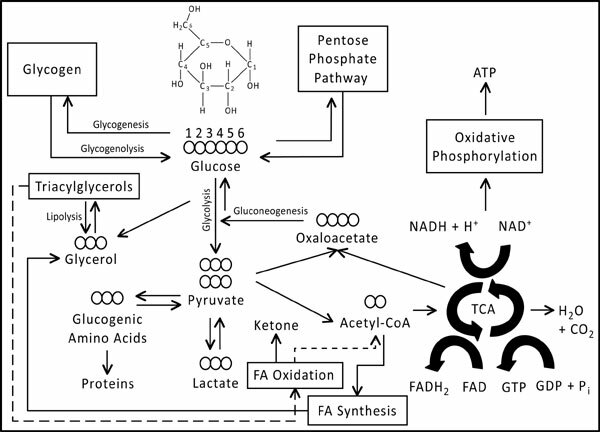 In the experiment, a constant intravenous dose of [6-13C1-6, 6’-2H2] glucose was converted in vivo to a series of [M+1] glucose isotopomers and unlabeled [M] glucose via gluconeogenesis while the orally administered [U-13C6] glucose was converted to a series of [M+3] and [M+2] glucose isotopomers via gluconeogenesis. The detection platform of the assay was based on a negative mode electrospray ionization liquid chromatography tandem mass spectrometry method where the deprotonated glucose anion and its various isotopomers were quantitated in rat plasma using multiple reaction monitoring techniques. The in vivo rat DIS-OGTT assay was a sensitive method for understanding drug candidates underlying postprandial effects on glucose absorption, hepatic glucose production, and insulin controlled glucose disposal. Since glucose derivatization was not required for this assay, a higher sample throughput DIS-OGTT was achieved.